South Africa’s city centres are the biggest crime hot spots across the country, according to crime data. Crimestatssa.com has broken down the latest SAPS crimes stats for 2018 regionally, to show which areas across South Africa’s nine provinces had the most reported crimes between April 2017 and March 2018. It should be noted, however, that station statistics may encompass more areas than where the station is located. For example, a station in a remote area may represent the reported crimes of several neighbourhoods and small towns surrounding it, as it is the only station available to service those areas. Crime levels are often tied to population numbers, thus is comes as no surprise that Gauteng, the Western Cape and KwaZulu Natal rank as the three provinces worst-affected by crime. These provinces are home the three most populous metro areas in the country – and across all three provinces, the city centres had the most reported crimes. 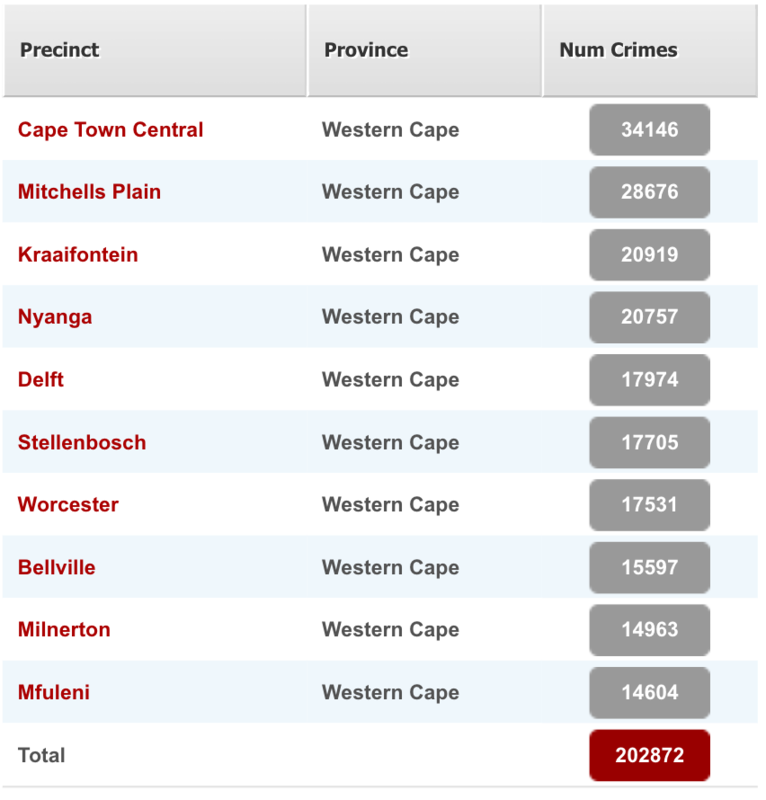 While Gauteng has the highest number of crimes, the worst precincts are still generally found in the Western Cape. According to Crimestatssa, 620,445 crimes were reported in Gauteng in 2018, of which, the 10 worst precincts accounted for 30.4%. The worst area, Johannesburg Central, had 4.3% of all crimes. 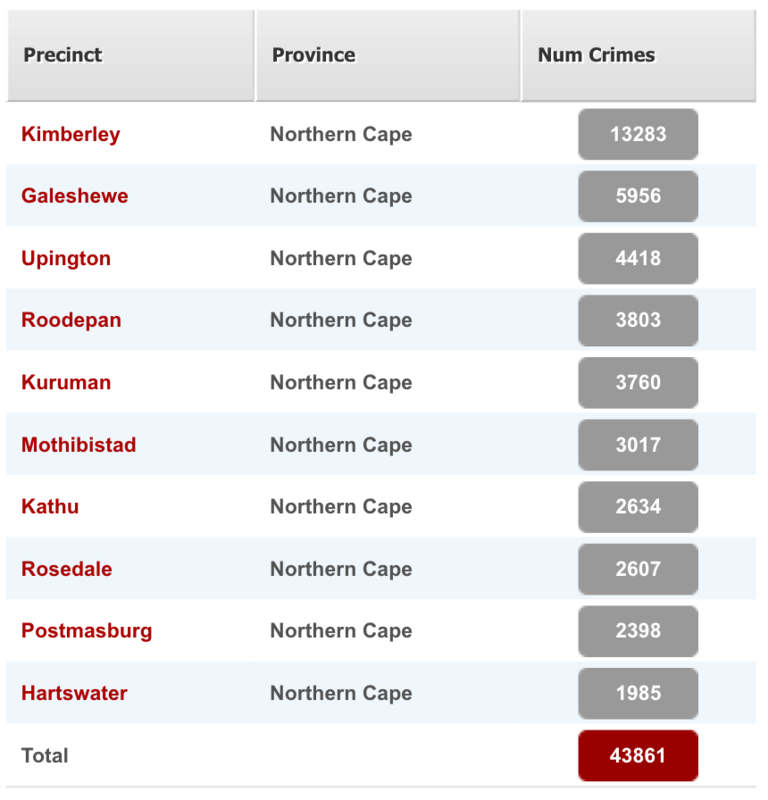 The Western Cape had 492,956 crimes in 2018, with the 10 worst precincts accounting for 41.2%. Cape Town Central had the highest number, representing 6.9% of the total. In KZN, there were 351,207 crimes, with the 10 worst areas accounting for 44.6% of those. 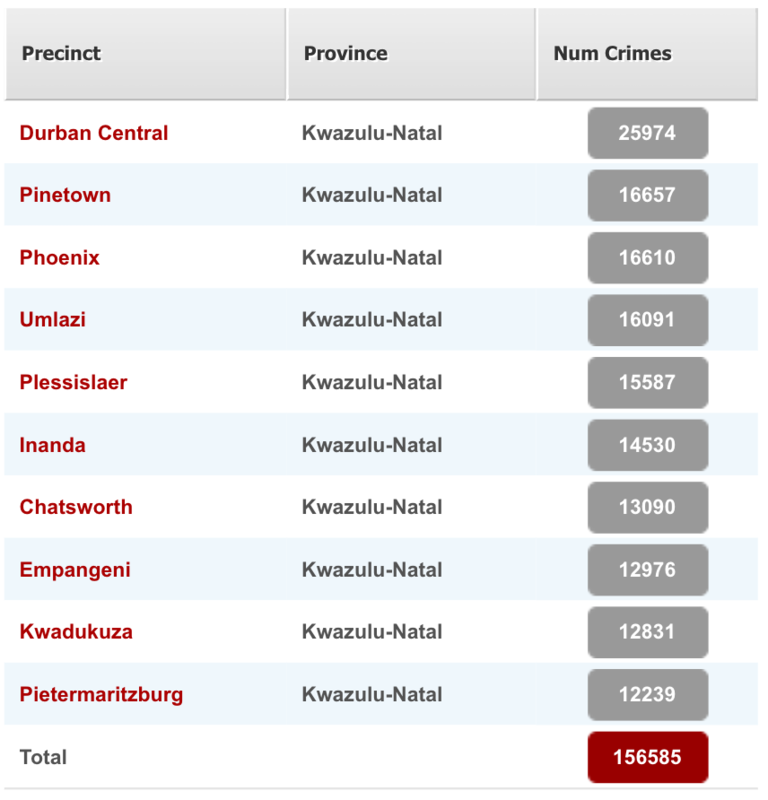 The worst area, Durban Central, had 7.4% of all crimes in the province. Of the 203,977 crimes in the Eastern Cape in 2018, the 10 worst precincts account for 46%. The worst area, East London, covers 6.8% of the crimes. 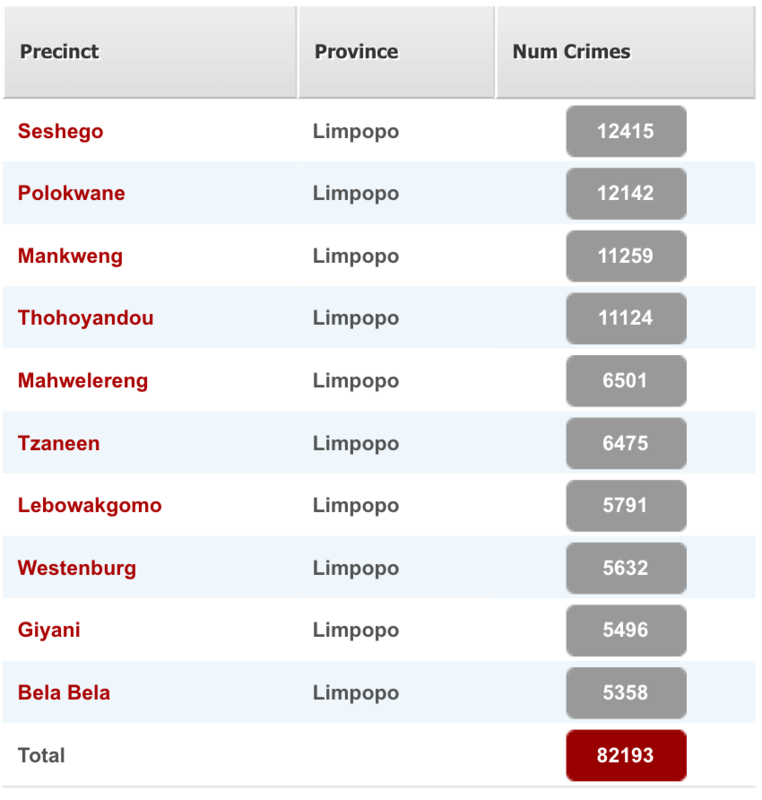 Limpopo saw 129,578 crimes in 2018, with the 10 worst areas accounting for 63.4% of the provincial total. Seshego was the worst precinct, with 9.6% of the crimes. 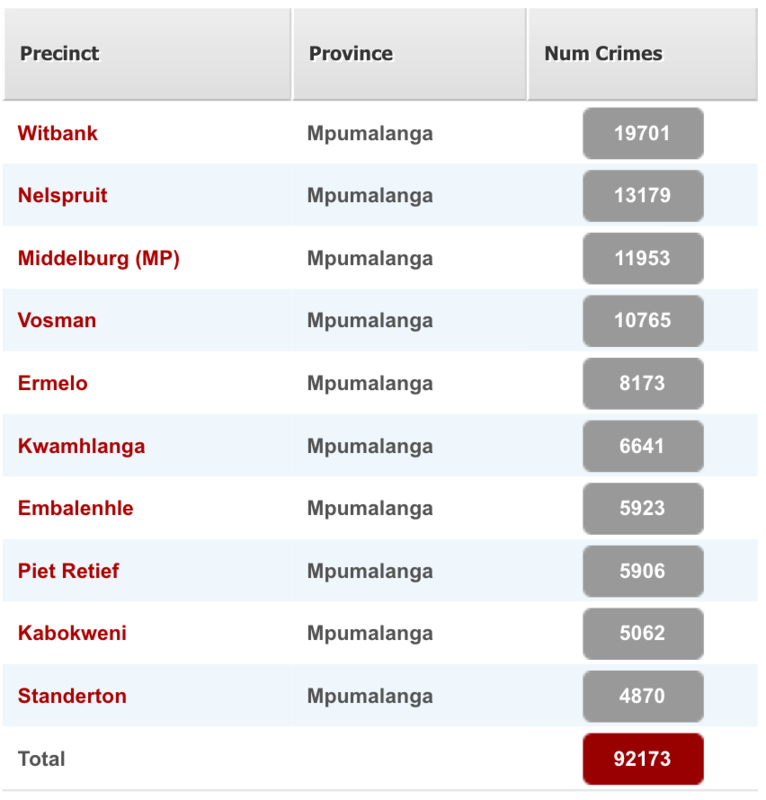 There were 124,859 crimes in Mpumalanga in 2018, with the 10 worst precincts accounting for 73.8%. The worst area was Witbank, which had 15.8% of the crimes. According to Crimestatssa, North West Province recorded 119,523 crimes, with the 10 worst precincts contributing 78.5% to that number. Rustenburg was the worst precinct, accounting for 15.7% of the total. The Free State recorded 112,177 crimes, with the 10 worst areas accounting for 73.6%. The worst precinct was Park Road, which contributed 18.2% to the total. The sparsely populated Northern Cape had the least reported crimes, with 49,570 in 2018, spread over a few areas. The worst precinct, Kimberly, is the most populated city in the province, and accounted for 30% of the total.